The Pokémon Go Fest in Chicago is fast approaching, but just because you don't live near the Windy City doesn't mean you can't participate. In fact, Niantic is encouraging players from all around the world to play on July 22 anyways as trainers from Chicago and the rest of the world will actually be working together to unlock special bonuses for everyone worldwide. As players in Chicago gather around Grant Park for a day of festivities, Niantic will be pushing out a perks system that requires Chicago players to work with players abroad and vice versa for additional in-game bonuses. Chicago trainers will be encouraged to capture Pokémon of a specific type, unlocking perks specific to that type. Meanwhile, players outside of Chicago will be encouraged to catch as many Pokémon as they can within specific Challenge Windows. If players worldwide catch enough Pokémon, a new challenge will unlock in Chicago, which once completed, will unlock a special bonus for everyone around the world. 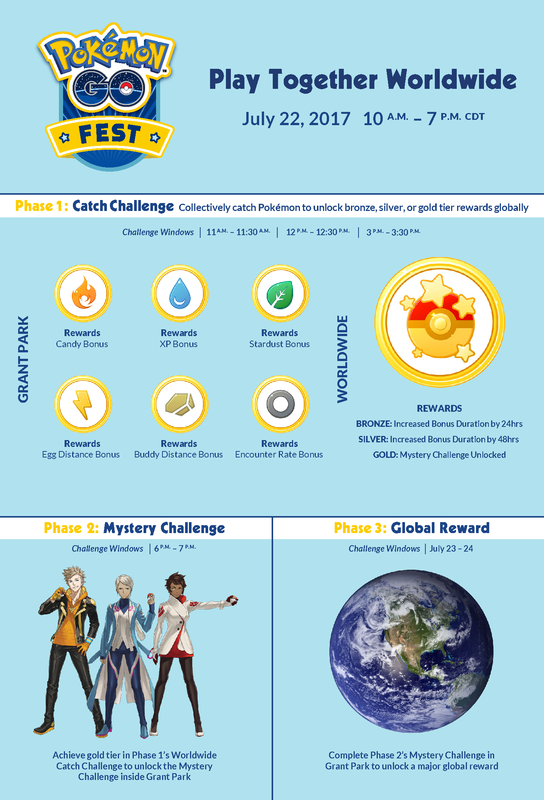 You can see a list of perks and challenges below in the chart Niantic published for the event. Not to let the rest of the world hanging, Niantic also announced a Safari Zone event for European players. Like its name, Niantic will be turning Europe into one huge Safari Zone (located at partnering malls) where players can catch rare Pokémon only available in the Safari Zone, much like the ones found in the Pokémon games. No word yet on if you can weaken Pokémon by throwing rocks at them, or by luring them with berries. Lastly, Japan will be experiencing a Pikachu Outbreak event from August 9-15 in Yokohama, Japan. No details yet on that event, but I assume Pikachu are involved. Niantic first announced the Chicago based event in celebration of Pokémon Go's one year anniversary. Players in attendance will already receive bonuses like special challenges and raids, medals, eggs, and of course, Pokémon encounters. Similar events have been announced like the Big Heritage event in the United Kingdom that will run from July 22-23. Tickets for the Chicago event are currently sold-out, though you might still be able to purchase tickets from resellers. Tagged with mobile,	News,	Niantic,	Nintendo,	Pokemon.